Background Late diagnosis of lung cancer can impact on survival rates. Patients delay seeking help for a number of reasons. This study explored symptom appraisal and help-seeking decisions among patients referred to specialist respiratory services with symptoms suggestive of lung cancer. Methods In-depth qualitative interviews with patients as soon as possible after referral, ideally before diagnosis and mainly within 10 weeks, explored factors impacting on their pathways prior to referral. Framework analysis, underpinned by the Model of Pathways to Treatment, was used to explore the data with particular focus on patients’ beliefs and experiences, disease factors and healthcare professional influences. Results 35 patients were interviewed (aged 41–88 years, 15 women, 17 with lung cancer). All described similar presenting symptoms and triggers to seek help. Appraisal of symptoms was influenced by whether they had a lung comorbidity; seriousness of symptoms was interpreted within the context of previous illness experiences. Help-seeking was triggered when: symptoms failed to respond as expected; there was an increased awareness of symptoms of lung cancer; the public nature of a cough meant others were able to endorse help-seeking. Almost half visited the general practitioner (GP) two or more times before referral; during this period they reinterpreted initial symptoms and appraised new symptoms. The meaning given to symptoms changed over time and many became increasingly concerned they may have lung cancer. The GP played a role in ensuring timely further help-seeking but often there was little guidance on how to monitor symptoms or when to reconsult. Conclusions Patients diagnosed with and without lung cancer had similar symptom pathways. Findings provide guidance for lung cancer awareness campaigns on the importance of social networks in endorsing patient help-seeking. The importance of appropriate advice, monitoring and safety-netting procedures by GPs for people presenting with symptoms suggestive of lung cancer is also highlighted. We believe this study is the first to compare the appraisal and help-seeking experiences of patients with symptoms indicative of lung cancer (such as cough, dyspnoea, haemoptysis, chest and back pain) between people subsequently diagnosed with lung cancer and people diagnosed with other non-cancer conditions. The study was guided by the Aarhus statement recommendations on improving design and reporting of studies on early cancer diagnosis. Recruiting at the time of referral to specialist respiratory services and interviewing patients before or close to diagnosis reduced risk of post hoc rationalisation and recall bias. Almost half of the study group visited the general practitioner (GP) two or more times before an appropriate investigation or referral was made, enabling us to report on the patient perception of GP advice on symptom monitoring and on when to reconsult. Lung cancer is the most common cause of cancer death in the UK. While there has been a fall in incidence in men, there has been a slow, steady increase of cases in women. It continues to have one of the poorest 5-year relative survival rates of all cancers,1 only 7.8% for men and 9.3% for women.2 Most cases of lung cancer present symptomatically, and poor survival rates are primarily due to later stage disease, the biology of the disease, lack of screening and fewer treatment options.3 ,4 Diagnosis in primary care is challenging as the majority of patients who present to their general practitioner (GP) with respiratory symptoms will not have lung cancer.5 Survival rates in the UK from lung cancer are poorer than in other European countries6 and it may be that negative beliefs about barriers to symptomatic presentation contribute to this.7 Understanding how patients recognise possible signs of lung cancer and the decisions they make about seeking help for their symptoms can inform the development of interventions to reduce the time to diagnose lung cancer and potentially improve survival. Raising awareness of cancer symptoms may help to promote timely help-seeking. Public health campaigns such as the ‘Be Clear on Cancer’ lung cancer campaign16 have been used to raise awareness of the signs of lung cancer. At a community level, there is evidence of increased awareness of lung cancer symptoms and increase in referrals to specialist respiratory services during similar campaigns.17 ,18 However, understanding the possible cause of a symptom does not always directly translate into seeking a consultation to discuss such symptoms.19 People have to make complex decisions about when it is appropriate to seek help, and in part these decisions are influenced by perception of personal risk.20 Decisions to seek help are also shaped by public and professional perception of what is a reasonable time to wait for symptoms to resolve spontaneously. While there is general consensus that ‘red flag symptoms’ such as haemoptysis21 should be presented and referred urgently, National Institute for Clinical Evidence (NICE) recommends that other respiratory symptoms such as cough and dyspnoea should have been present for at least 3 weeks before investigation by chest X-ray.22 Therefore, it is important that we more fully understand the reasoning behind patients’ help-seeking decisions for a range of respiratory symptoms in order that interventions, particularly those aimed at promoting presentation of symptoms, can be developed to improve timeliness of help-seeking. To date, studies exploring patient appraisal and help-seeking for symptoms suggestive of lung cancer have only reported the experiences of those diagnosed with lung cancer, and have interviewed or surveyed patients often several months or years after diagnosis. These studies may be biased by post hoc rationalisation and recall bias. Patients are more likely to recall their appraisal and help-seeking decisions fully if they are interviewed as close as possible to the time they were experienced, and preferably before their diagnosis is known. Our aim was to understand the symptom evaluation, or ‘appraisal’, and help-seeking decisions of patients with symptoms suggestive of lung cancer. In this paper, we report the results from an interview study that recruited people with respiratory symptoms referred to specialist respiratory services for consideration of possible cancer, irrespective of their subsequent diagnosis. This method enabled us to explore the complex processes and events that shaped patient appraisal and help-seeking from when they first noticed a symptom, to first consultation with a healthcare professional (HCP), through until they were referred. This in-depth, face-to-face interview study was nested within the SYMPTOM Lung Study (http://discovery-programme.org/symptom_study.php). The SYMPTOM study was a prospective cohort study investigating associations between symptoms and other factors on the total diagnostic interval and stage of diagnosis among patients with symptoms suggestive of lung, colorectal and pancreatic cancer. This interview study used qualitative methods to explore the factors that affected patient appraisal and help-seeking for respiratory symptoms. Ethical approval was obtained from Cambridgeshire 3 Research Ethics Committee (10/H0306/50). The study design, including data collection and analysis, was underpinned by the theoretical approach of the Model of Pathways to Treatment (figure 1).23 ,24 The model enables explicit consideration of patient, disease and healthcare factors that impact on patients’ appraisal of symptoms and decisions to seek help. Using a theoretical framework and the definitions of events along the patient pathway reflects best practice as defined in the Aarhus Statement.25 Detecting bodily change, perceiving a reason to seek help and first consulting a HCP are key ‘milestones’ or events in the pathway to treatment, and represent the ‘time to presentation’ (TTP).25 We define TTP as the interval between the patient-reported date of first noticing a symptom and their first consultation with an HCP, usually their GP. However, as one-third of patients with lung cancer consult their GP three times before referral,26 for participants who are not referred after the first consultation, we have also defined their further symptom appraisal and decisions to seek help again as the ‘Re-appraisal Interval’. This definition has resonance with the iterative nature of the Appraisal and Help-seeking Intervals as illustrated in the Pathways to Treatment model, figure 1. 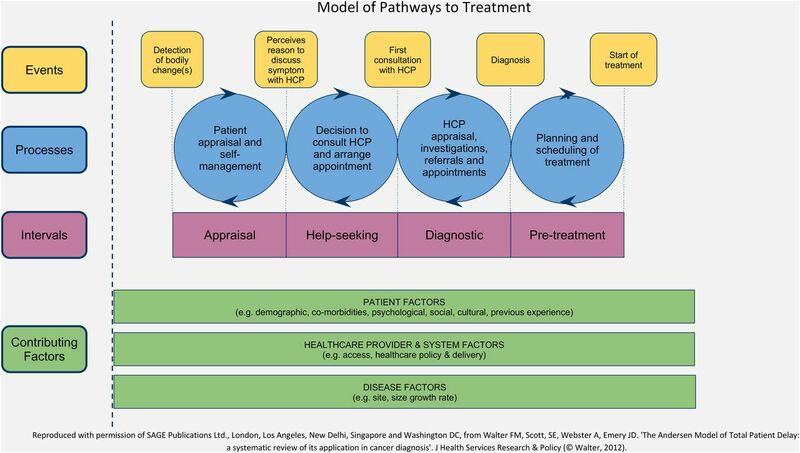 Model of pathways to treatment (HCP, healthcare professional). Recruitment to the study was undertaken when patients were referred to specialist respiratory clinics in secondary and tertiary care at five hospitals in the East and North East of England. Patients aged 40 years and over, referred to hospital via urgent (2 week wait), routine and diagnostic routes, for whom GPs had reported symptoms potentially suggestive of lung cancer, were mailed an introduction letter and SYMPTOM questionnaire, and invited to join the SYMPTOM study. They were also invited to take part in this interview study. We purposively sampled participants by region, selecting for variation of age, gender, educational level and diagnoses (cancer/other non-cancer). Interviews were undertaken by NH, KM and LB between November 2011 and January 2013. Interviews were conducted as soon as possible after referral to specialist respiratory care, the majority within 10 weeks. Twelve participants were unaware of their diagnosis at interview (2 lung cancer). All diagnoses were confirmed from review of secondary care medical records. Interviews lasted between 40 and 65 minutes and were usually conducted in the participant's home; one person chose to be interviewed in university offices and another in their workplace. In several of the interviews a relative, usually spouse, was present. Relatives contributed to the interview by confirming participant's comments or adding detail to the account. Interviews continued until saturation of data, when no new themes were identified in three consecutive interviews.28 Audio-recordings of interviews were professionally transcribed verbatim and anonymised. Analysis was an iterative process that started after the first few interviews. Framework analysis methods were used to ensure a systematic and rigorous progression through the five analytic steps: familiarisation with data; developing thematic framework; indexing data to framework; mapping and questioning the data; and theoretical interpretation.29 The thematic framework was developed by NH and KM in consultation with FW and LB; our study patient representative (MJ) also contributed to all stages of analysis. Data management was assisted by NVivo V.9. During the mapping and questioning of data, we examined transcripts of participants diagnosed with lung cancer and compared them with those who presented with similar symptoms but who were diagnosed with other non-cancer conditions. We explicitly considered symptom appraisal, decisions about help-seeking, re-appraisal and further help-seeking. Following thematic analysis, data were charted by patient characteristics (age, gender, smoking, lung comorbidity and geographical region) to seek patterns or non-confirming cases between those diagnosed with lung cancer and those diagnosed with other non-cancer conditions. Seven hundred and seventy-six (81% n=963) of the participants recruited into the main SYMPTOM Lung study expressed an interest in taking part in the interview study. We undertook purposive sampling among this group, and only seven people declined to be interviewed because they were feeling unwell or were too busy with hospital appointments. We undertook 35 interviews; 17 participants were diagnosed with lung cancer and 18 with other conditions. Table 1 shows the sociodemographic characteristics of the cohort, as reported in the SYMPTOM Lung study. The characteristics of the interview study cohort were similar to those of the SYMPTOM Lung study, although there were more smokers in the interview study. We purposefully sampled for people with a cancer diagnosis. In the interview study nearly half (49%) of the cohort had lung cancer compared with only 16% in the questionnaire study. Both cohorts had similar sociodemographic characteristics (ethnicity, education, employment). In the interview study nine reported they had existing lung comorbidity (4 COPD, 3 asthma, 2 other lung conditions). Of the 17 participants diagnosed with lung cancer, one had a lung metastasis from a primary colon cancer; eight had disease staged with potential for treatment with curative intent (stage I n=4; stage II n=4), while eight had more advanced disease (stage III n=1; stage IV n=7). The 18 participants with other conditions mainly had inflammatory conditions, see table 1. Seven participants did not seek help because of respiratory symptom/s; however, they did retrospectively recall respiratory symptoms and these data were included in our analysis. Three were referred to respiratory clinics following CT scan or MRI for non-respiratory symptoms, which reported lung abnormalities (2 lung cancer), and four had their respiratory condition opportunistically detected during consultations with GPs for other health concerns (2 lung cancer). Most of the remaining 28 participants could recall when they first noticed their symptom/s and the date they went to the GP, though many were unable to recall the exact date they decided to seek help (ie, the start of the Help-seeking Interval in figure 1). We report the Appraisal Interval and first Help-seeking Interval as the TTP. The TTP ranged from 2 to 334 days; just under half consulted within 30 days of first noticing a symptom. Table 2 presents the characteristics of participants in the quartiles with the shortest and longest TTP, demonstrating similarities in age, gender, initial symptom attributions and trigger for help-seeking between those diagnosed with lung cancer and those diagnosed with other non-cancer conditions. For the 16 (6 lung cancer) who consulted their GP two or more times before referral to specialist respiratory services, we also report the number of days between their first consultation and their referral: the Re-appraisal Interval. The time between first consultation and referral was between 10 and 182 days; for seven participants it was over 60 days (2 lung cancer). There were similarities in the Re-appraisal Interval between participants diagnosed with lung cancer and those diagnosed with other non-cancer conditions, although overall, patients diagnosed with lung cancer had fewer GP visits and were mainly referred under the 2 week wait referral system (table 3). The appraisal of symptoms describes how they are difficult to recognise, and that lung comorbidities often masked respiratory changes, the alternative explanations offered for the cause of symptoms, and the ways in which symptoms were self-managed prior to help-seeking. Deciding to seek help describes the factors that helped to endorse a decision to seek a GP consultation, including symptoms such as signs of acute illness, recognising a changing symptom, symptoms not responding as expected, the influence of family members and the social network, increased awareness of lung cancer and the impact of smoking on help-seeking. Symptom re-appraisal and returning to the GP describes the factors that shaped the decision to seek a further consultation including symptom change, increasing impact of symptom on activities, increasing concern about personal risk of having lung cancer and the role of the GP in endorsing such help-seeking. Extracts from interviews illustrate the results; each quotation is contextualised by the participant's gender, age band, smoking history, TTP in days, diagnosis (cancer, non-cancer) and if diagnosis was not known at time of interview. The first interval in the patient pathway is the appraisal and self-management of symptom/s. If a symptom was difficult to recognise, attributed to ageing or smoking, or appraised as a condition that could be self-managed, participants often remained for some time in the appraisal interval. We found no evidence of differences between those diagnosed with lung cancer and those diagnosed with other non-cancer conditions across any of the factors, as shown in table 4. The insidious nature of some respiratory symptoms made it difficult to recognise a change in respiratory function “breathlessness has been creeping up” (M, 55–59, smoker, 60 days, non-cancer). An elderly man diagnosed with lung cancer explained he felt “not quite right, yucky, bit weary and tired”. He said he could not describe his symptoms sufficiently to justify visiting the doctor and waited 8 weeks before consulting his GP. Alternative explanations provided for the cause of symptoms were usually contextualised by anticipated changes in bodily function, or as a reaction to specific activities. For example, older people may expect to be more breathless on exertion: “I noticed maybe a few time I was not able to walk as fast as I used to be able to do, but I didn't think much about it…I am 72 I am going to begin to slow down” (M, 70–74, ex-smoker, 14 days, cancer). Not all smokers mentioned smoking when discussing their appraisal or help-seeking but the few who did explained their symptom could be due to smoking. Another explanation, particularly for pain, was muscle strain. The explanation was justified within the context of activity: “I do a lot of work around the garden, picking things up, obviously muscles go into a bit of a spasm, so not to worry” (M, 65–69, ex-smoker, 21 days, cancer). The decision to consult an HCP and move from appraising symptoms to seeking help was triggered by patient, disease and, to lesser extent, healthcare factors. Appraising symptom/s as a sign of acute illness prompted timely help-seeking. Family members and friends recognised symptoms in the participants and encouraged them to seek help. Increasing awareness of the signs of lung cancer, usually due to the ‘Be Clear on Cancer Campaign’, prompted help-seeking. Participants did not report that their smoking behaviour was an inhibitor to help-seeking. Competing responsibilities and limited access to healthcare prolonged the TTP for only a few participants, see table 4. When acute illness was experienced help-seeking was rapid, and those diagnosed with cancer and those diagnosed with other non-cancer conditions both said they had been well before their acute symptoms. When asked to clarify how long she had been feeling breathless one woman explained “maximum a week, up until then was still swimming 3 times a week, I'd walk for a good hour every day, I'd play table tennis just carry on as normal” (F, 65–69, ex-smoker, 7 days, cancer). Symptoms not appraised as being due to a lung condition were often also attributed to an acute illness based on previous experience. For example, one man with a history of intermittent pain in the lower back and recent gallstones attributed his pain to a kidney infection and sought help promptly. Even when participants lived alone, those who spoke to family and friends about their symptoms were encouraged to consult a GP, “brother said ‘I'm telling you now to go to the doctor” (M, 70–74, ex-smoker, 14 days, non-cancer). Another man who lived alone explained “my friend went up to see the doctor and said I was in a bad way and the GP came here” (M, 60–64, ex-smoker, internal hospital referral for sleep apnoea tests, non-cancer). Participants were generally happy with the outcome of their initial consultation, but when the prescribed treatment was not effective or their symptom changed, they started a process of re-appraisal and made decisions about whether to seek another GP consultation. There were similarities in the help-seeking decisions of those diagnosed with lung cancer and those diagnosed with other non-cancer conditions (see table 5). In this section each quotation is contextualised by the participant's gender, age band, smoking history, TTP in days, re-appraisal time in days and diagnosis. The decision to reconsult was not always an easy one. A minority of participants reported they felt the GP was dismissive of their symptom/s and concerns, “I said no, no, you're not listening to me I've had this cough for ages and ages, it's not just an overnight thing” (F, 65–69, never smoked, TTP 30 days, Re-appraisal 138 days, non-cancer, diagnosis not known). When this patient returned a few months later and reported his haemoptysis again the nurse phoned the doctor directly and he had a chest X-ray within 24 h.
We believe this is the first study to explore the appraisal and help-seeking decisions of patients responding to symptoms suggestive of lung cancer. Unsurprisingly, there are few differences in the appraisal of symptoms, decisions to seek help, TTPs and re-appraisal intervals between people diagnosed with lung cancer and other conditions. We found evidence of complex reasoning and decision-making supporting the processes of deciding whether and when to seek help. While patients often recognised new symptoms or subtle symptom changes, even against a background of the expected symptoms of lung and cardiac comorbidities or being a smoker, they often did not feel the need to seek help because they developed alternative explanations based on their previous experiences or believed they could self-manage the symptoms. Help-seeking was triggered by recognising the symptoms as signs of acute or serious illness, the progression or persistence of existing symptoms or new symptoms, the influence of family members and their social network, particularly due to the visibility of symptoms, and sometimes current public health messages. Half the sample received treatment for other conditions, such as for acute respiratory illness, and had not been referred after their first GP consultation. Symptom monitoring and re-appraisal followed; returning to the GP was again influenced by the progression or persistence of existing symptoms or new symptoms, an impact of symptoms on daily living activities, and increasing concern about underlying serious disease and cancer. We found little evidence that patients received adequate advice from their GPs about symptom monitoring or reasons to return for review. The major strength of this study is that we interviewed people during their pathway to diagnosis and treatment, often before they received their diagnosis; therefore we were able to compare accounts of people diagnosed with lung cancer and other non-cancer conditions. We sought to interview people as early in their disease development as possible. Interviewing 12 people before they received their diagnosis helped to reduce post hoc rationalisation and recall bias,9 ,11–13 and the remaining interviews were conducted as soon as possible after diagnosis (range: 1 day to 16 weeks), with 15 (43%) occurring within 4 weeks of diagnosis. Importantly, we were able to include people with advanced stage cancer before they became too ill to participate in research. In accordance with the guidelines outlined in the Aarhus Statement on improving design and reporting of studies on early cancer diagnosis,25 we used a rigorous study design with the theoretical Model of Pathways to Treatment23 underpinning the interview schedule as well as the analysis. The calendar-landmarking instrument helped some participants recall dates and symptom changes. Purposive sampling from two areas of England ensured data were reported from people with differing socioeconomic backgrounds and differing exposures to carcinogenic environments. For example, some people in the North East spoke of personal risk due to proximity to, or employment in, heavy industry. Our broad range of scientific and clinical expertise helped ensure consensus in the findings, and we benefitted from the input of our lay member at all stages of the research process, including interpretation of the data. While we used a calendar-landmarking instrument during the interviews to ensure, as far as possible, the accuracy of time intervals, some people were unable to recall precise dates and we took the dates from their responses to the questionnaire in the main SYMPTOM lung study. The nature of qualitative data collection is such that we can only report the experiences patients chose to divulge; it may be that they did not share experiences that they considered to be private or embarrassing. We recruited people with symptoms suggestive of lung cancer, and included patients who were not aware of their diagnosis at the time of interview, those who were diagnosed with other non-cancer conditions as well as people diagnosed with early and later stage lung cancer. We are therefore able to add new insights to the existing literature on the experiences and decision-making processes of people with lung cancer9–13 in order to develop new targeted interventions to promote timelier lung cancer diagnosis. We found that initial alternative explanations for symptoms were based on patients’ previous experiences, for example, a dry cough during summer was attributed to hay fever, and slight breathlessness in winter attributed to a chest infection. This is concordant with findings from a UK interview study of patients with operable and inoperable lung cancer, which reported that they minimised, normalised or misattributed symptoms.12 However, that study also reported their patients lacked agency in seeking help; in contrast, patients in our study tended to either adopt ‘watchful waiting’ to see if symptoms improved, or to self-manage symptoms with over the counter drugs. The nature of cough has been discussed in the context of those with lung cancer32 and we add to this discussion by reporting the impact of cough on help-seeking prior to diagnosis. The very public nature of a chronic cough prompted members of the family and the wider social network to encourage and endorse help-seeking. The impact of cough on daily activities, such as talking on the phone and shopping, also triggered initial and subsequent help-seeking. Living alone has been reported as a factor in prolonging help-seeking,9 ,33 but in line with an earlier interview study by Tod et al,34 we found that if the participant's symptom was observed by, or discussed with, family and friends, then timely help-seeking often took place. As we interviewed patients during a national ‘Be Clear on Cancer’ lung cancer campaign16 we are able to comment on the possible impact of the campaign on patient's symptom appraisal and help-seeking behaviour. Some patients who had seen the campaign had a heightened awareness of respiratory symptoms, particularly a persistent cough; for them the campaign endorsed the need to seek help in line with findings from other studies reporting the impact of similar health campaigns.17 ,18 However, in our study there were two patients who reported that an increased awareness had slightly prolonged their help-seeking as they were concerned they were over-reacting. This is one of the first studies to explicitly explore patient processes during the time between first consulting a HCP, and further consultations leading to investigations and referral. During the Re-appraisal Interval participants continued to consider symptom change, severity and duration as triggers to return to the GP, but rarely reported receiving guidance from their HCP on symptom monitoring or when to reconsult. There were examples of substantial time intervals between GP consultations.5 Those who were given explicit advice on symptom monitoring and when to return to the GP (so-called safety netting),35 promptly sought further consultations enabling GPs to continue diagnostic investigations in a timely way. We found some examples where patients with comorbidities accessed regular healthcare but the HCP did not seem to use the opportunity to follow-up on previously disclosed symptoms suggestive of lung cancer. Despite the evidence suggesting that people delay help-seeking due to fear of cancer, we found that patients were often unconcerned that symptoms may be indicative of lung cancer even when they had increased risk due to current or recent smoking habits.20 ,36 ,37 In our study, concerns about candidacy for lung cancer were only discussed within the context of reappraising symptoms and when alternative explanations failed to respond as expected to initial treatment. Our findings provide further evidence for targeted public health campaigns that are tailored to specific groups such as smokers and people with other chest conditions who may have difficultly detecting symptom change, focusing not only on recognition of new, changing and persistent symptoms but also on recognising reduced effectiveness of medications. The role of family and social networks in recognising and discussing a symptom, and then endorsing help-seeking, could contribute more prominently to public health initiatives to raise community awareness of appropriate help-seeking for timely diagnosis of lung cancer and other serious lung conditions. The vast majority of people who seek help for respiratory symptoms will not have lung cancer but our findings indicate that those with cancer and other non-cancer diagnoses all undertake similar complex reasoning and decision-making when deciding whether and when to seek help. There is a need for further research into the ways in which people make these complex decisions around assessing the seriousness and severity of symptoms, the triggers to seek a medical consultation, and their explanations about which symptoms can be self-managed. Understanding the social context in which risks of ill health are assessed would provide more opportunities for the development of targeted and evidence-based interventions to promote timely help-seeking. The authors thank the patients who so kindly and freely gave their time and experiences to this study. They thank Helen Morris, the SYMPTOM study manager, our other study patient, and public representatives Victor Boulter and Sue Ballard, and the NHS trusts and their nurses who recruited patients and collected data. The authors would also like to acknowledge the contribution made by the Discovery Programme Steering Committee comprising: Roger Jones (chair); Greg Rubin; Alison Clutterbuck; Ardiana Gjini; Joanne Hartland; Maire Justice; Jenny Knowles; Richard Neal; Peter Rose. Cancer Research UK. Key facts on lung cancer and smoking. http://www.cancerresearchuk.org/cancer-info/cancerstats/keyfacts/lung-cancer/cancerstats-key-facts-on-lung-cancer-and-smoking (accessed 15 Apr 2014). Cancer Research UK. Lung cancer survival statistics 2012. http://www.cancerresearchuk.org/cancer-info/cancerstats/types/lung/survival/ (accessed 15 Apr 2014). Health and Social Care Information Centre. National Lung Cancer Audit Report 2013. http://www.hscic.gov.uk (accessed 22 Apr 2014).
. The size of the prize for earlier diagnosis of cancer in England. Br J Cancer 2009;101(Suppl 2):S125–9.
. Delay in diagnosis of lung cancer in general practice. Br J Gen Pract 2006;56:863–8.
. Cancer survival in Australia, Canada, Denmark, Norway, Sweden, and the UK, 1995–2007 (the International Cancer Benchmarking Partnership): an analysis of population-based cancer. Lancet 2011;377:127–38.
. Differences in cancer awareness and beliefs between Australia, Canada, Denmark, Norway, Sweden and the UK (the International Cancer Benchmarking Partnership): do they contribute to difference in cancer survival? Br J Cancer 2013;108:292–300.
. Patient delay in presentation of possible cancer symptoms: the contribution of knowledge and attitudes in UK population study. Cancer Epidemiol Biomarkers Prev 2010;19:2272–7.
. Factors contributing to the time taken to consult with symptoms of lung cancer; a cross sectional study. Thorax 2009;64:523–31.
. Stigma, shame and blame experienced by patients with lung cancer: qualitative study. BMJ 2004;328:83–5.
. Is late diagnosis of lung cancer inevitable? Interview study of patients; recollections of symptoms before diagnosis. Thorax 2005;60:314–19.
. Experience of health care changes and reasons for delay in seeking care: a UK study of the months prior to diagnosis of lung cancer. Soc Sci Med 2006;62: 1381–91.
. Eliciting symptoms interpreted as normal by patients with early-stage lung cancer: could GP elicitation of normalised symptoms reduce delay in diagnosis? Cross-sectional interview study. BMJ Open 2012;2:e001977.
. Knowledge of lung cancer symptoms and risk factors in the UK: development of a measure and results from a population-based survey. Thorax 2012;67:426–32.
. The influence of social factors on help-seeking for people with lung cancer. Eur J Cancer Care 2013;22:709–13. Cancer Research UK. About Be Clear On Cancer Campaign 2011. http://www.cancerresearchuk.org/cancerinfo/spotcancerearly/naedi/beclearoncancer/background (accessed 13 May 2014). Department of Health. How are be clear on cancer campaigns evaluated. http://www.cancerresearchuk.org/prod_consump/groups/cr_common/@nre/@hea/documents/generalcontent/cr_113267.pdf (accessed 13 May 14).
. Early diagnosis of lung cancer: an evaluation of a community-based social marketing intervention. Thorax 2012;67:412–17.
. Interventions to promote cancer awareness and early presentation: a systematic review. Br J Cancer 2009;101:531–9.
. Diagnosing cancer in the bush: a mixed-methods study of symptom appraisal and help-seeking behaviour in people with cancer in rural Western Australia. Fam Prac 2013;30:294–301.
. Alarm symptoms and identification of non-cancer diagnoses in primary care: cohort study. BMJ 2009;339:b3094. National Institute for Clinical Evidence. Referral guidelines for suspected cancer. 2005. http://publications.nice.org.uk/referral-guidelines-for-suspected-cancer-cg27/guidance (accessed 14 Jul 2014).
. The Andersen Model of total patient delay: a systematic review of its application in cancer diagnosis. J Health Serv Res Policy 2012;17:110–18.
. The model of pathways to treatment: conceptualization and integration with existing theory. Br J Health Psychol 2013;18:45–65.
. The Aarhus statement: improving design and reporting of studies on early cancer diagnosis. Br J Cancer 2012;106:1262–7.
. Measures of promptness of cancer diagnosis in primary care: secondary analysis of national audit data on patients with 18 common and rarer cancers. Br J Cancer 2013;108:686–90.
. Applications of calendar instruments in social surveys: a review. Qual Quant 2009;43:333–49.
. How many interviews are enough? An experiment in data saturation and variability. Field Methods 2006;18:59–82.
. Qualitative data analysis for applied policy research. In: Bryman A, Burgess R, eds. Analysing qualitative data. London: Routledge, 1993:173–94.
. Pathways to the diagnosis of lung cancer in the UK: a cohort study. BMC Fam Prac 2008;9:31.
. ‘Containment’ as an analytical framework for understanding patient delay: a qualitative study of cancer patients’ symptom interpretation process. Soc Sci Med 2010;71:378–85.
. The experience of cough in patients diagnosed with lung cancer. Support Care Cancer 2011;19:1997–2004.
. Sociodemographic factors and delays in the diagnosis of six cancers: analysis from the ‘National Survey of NHS patients: Cancer’. Br J Cancer 2005;92:1971–5.
. Diagnostic delay in lung cancer: a qualitative study. J Adv Nurs 2008;61:336–43.
. Framing the onset of lung cancer biographically: narratives of continuity and disruption. Psycho-Oncology 2007;16:466–73.
. Mapping patients’ experiences from initial change in health to cancer diagnosis: a qualitative exploration of patient and system factors mediating this process. Eur J Cancer Care 2010;19: 98–109. Contributors FMW is the guarantor. All authors approve the final version of the manuscript. All authors contributed to study design, study conduct and study management. LB, NH and KM collected the data and with FMW analysed and interpreted the data. LB, NH and FMW wrote the first draft of the report, and JE, JB, MJ, WH and KM made revisions and agreed the on the final draft. Funding This report presents independent research funded by the National Institute for Health Research Programme Grants for Applied Research programme (RP-PG-0608–10045). Ethics approval Cambridgeshire 3 Research Ethics Committee (10/H0306/50).